Labor Day, the first Monday in September, can’t come soon enough for working folks who get an extra paid day-off. Often celebrated with BBQs, picnics, and apple pie, it almost feels like a second 4th of July! But instead of celebrating our independence, we celebrate a day off and the end of summer. Yet what about that labor thing? 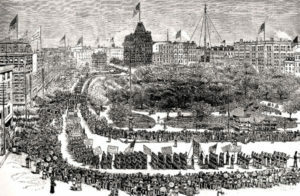 When the first Labor Day parade was held on September 5, 1882, few knew that a movement had begun, state by state, to make it a federal holiday and indeed, in 1894 Congress passed an act making the first Monday in September of each year a legal holiday. But to this day, no one is quite sure who first proposed it. Both possible founders had the same last name, but were unrelated except that they both were union people. Peter McGuire was with the Brotherhood of Carpenters & Joiners, and Matthew Maguire was a machinist with Local 344 union. What is clear is that when the Central Labor Union proposed Labor Day as a holiday, they held a picnic. The celebration of Labor Day was to be observed with street parades to demonstrate the strength and brotherhood of the trade and labor organizations. This was to be followed with “recreation and amusements” for the workers and their families. These things were happening while America was creating the highest standard of living and the greatest production the world has ever known. It literally celebrates our national strength, freedom and leadership based on traditional ideals of economic and political democracy. In other words—the American Worker! The RV Capital of the World—Elkhart, Indiana—was never big on labor unions. In the early 2000s, the RV industry was doing so well, and their workers were so well-paid by benevolent company owners, that the unions had a hard time organizing and enlisting laborers. Then came the panic of ’08 that walloped the industry—28% free fall in sales from manufacturers like Jayco, Monaco Coach and others. From Elkhart to Middleburg and from Mishawaka to Wakarusa—areas considered the backbone of the RV industry—families were hurting and unemployment soared. But people love the RV lifestyle, as proven by the steady rebounding of the RV industry. According to the RVIA, RV shipments in 2008 were down 32.9%; yet by 2014 they were up 11.1% for the fifth straight year, with promise for growth. Whether laborers in the USA are union or non-union, Labor Day is still a time to celebrate our freedom from any labor—be it from an 8–5 job or just not doing laundry on Monday. So get out there and celebrate with a good old-fashioned red-white-and-blue picnic!